The Motorcycle Urn with Applique is the perfect memorial for a biker. 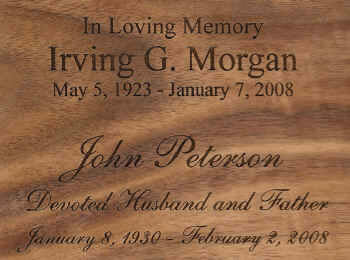 The wood urn is available with a cherry (shown in photo), oak, maple, or walnut finish and includes a motorcycle applique and personalized laser engraving. The urn loads from the bottom by removing several screws and a plate. Motorcycle applique is shipped separately. Applique has a sticky backing for easy application. As with all urns, it is recommended that you keep the cremains in a sealed plastic bag inside the urn. Engraving included. Please limit engraving to no more than 35 spaces per line. No engraving proof will be provided. Please make sure capitalization, punctuation, spelling, and dates are correct. Motorcycle Applique: 4.5" x 2.25"
Please allow 2-4 business days before shipping, even for expedited orders. Ships from the West Coast.